Today we will talk about the 2014 Beaujolais vintage, the French famous “new wine” made from Gamay grapes. This wine is well characterized by simplicity, freshness and red fresh fruit perfumes at the nose and is great to be served in pairing with winter dishes and not only: it is a good companion of roasted chestnuts, soups, vegetable soups, white meat, fresh cheese, mushrooms, vegetables, fish and pizza. I’ve tried three Beaujolais, to get an idea of what we can expect from this 2014 harvest. 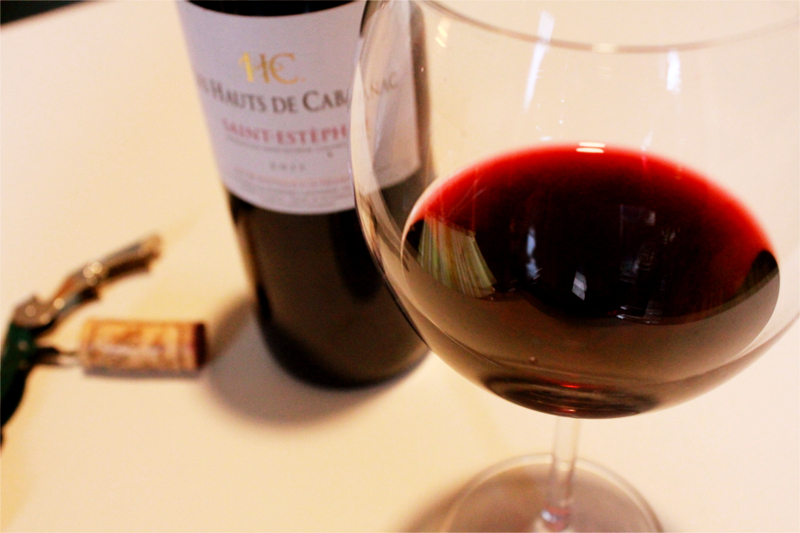 Purple in color, this Beaujolais is characterized by a good freshness and a delicate tannin. It is a balanced wine and quite fine. At the nose, rounded and intense perfumes of ripe banana and ripe strawberries. Similar perfumes as the Dubœuf Beaujolais, although a bit more pungent. On the palate, it is perceived more freshness and a slight hint of bitterness which characterizes the final. Good balance too. The color is more lively and has a remarkable smoothness on the palate, in which is perceived more tannin, although it remains delicate. At the nose more floral notes, including fresh violets, and the banana perfume is more attenuated, donating more finesse to the wine perfume. Did you try other Beaujolais or the same? Comment and share your opinion! Here’s to you my recipe for the Ragù. It’s very easy to prepare and does not require much time, from an hour to three, depending on your available time and the intensity of the flavor you want for the Ragù. I hope this recipe will be clear to you: comment and ask if you have questions or if you want to share your results! 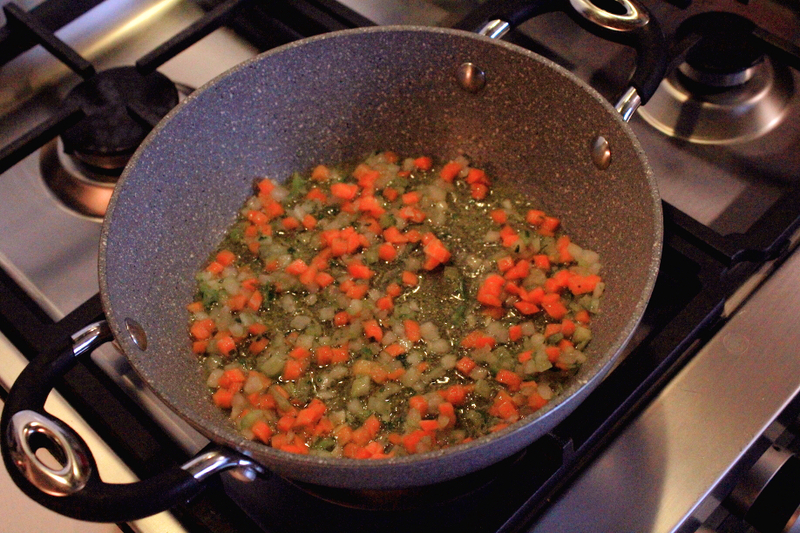 Chop finely and saute, with a drizzle of olive oil (or butter) in a pan, the half celery, carrot and onion for 6-7 minutes, until it’s golden (see figure below). 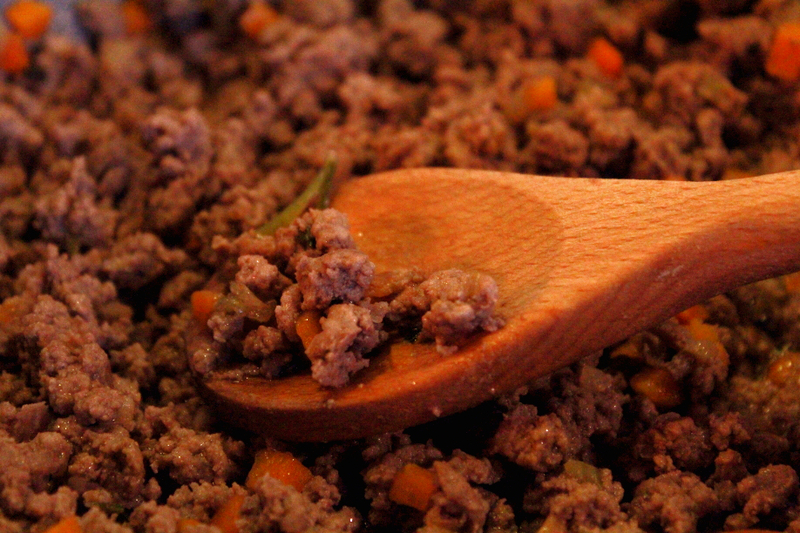 Add the ground beef and the sausage (removed of its peel), suitably mixed, and sear it, taking care to “hit” it in such a way as to form many small lumps. Then, once the meat has dried of its juices, sprinkle the meat with a glass of white wine (or red, if you want to give a stronger flavor to the sauce). Let the wine dry, add salt, pepper and a pinch of nutmeg. Lower the heat to minimum and add the tomato puree and pulp. Also add a teaspoon of sugar to counteract the acidity of the tomato. Cover the pan with a lid, but not completely. 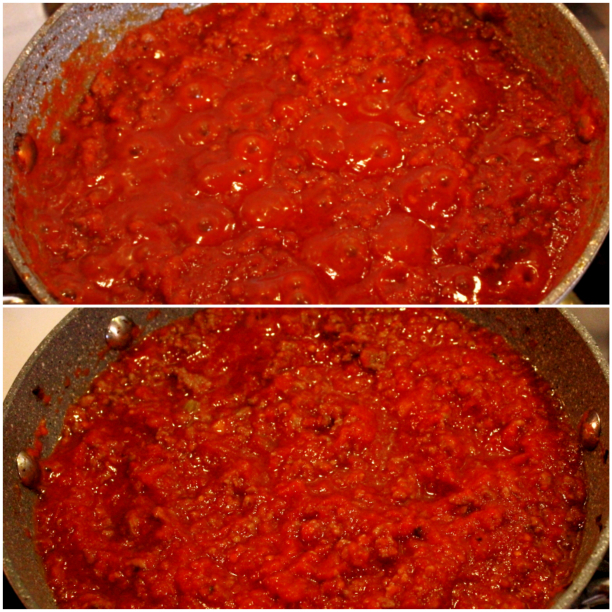 Every 15-20 minutes, stir the meat sauce and add each time, if necessary, half a glass of warm water, in order not to burn the sauce (see figure below, dried Ragù vs right Ragù). After an hour, the sauce is ready to be served on a plate of pasta, preferably a short type like “Penne”, “Farfalle”, “Tortiglioni”, “Fusilli”, “Rigatoni”. 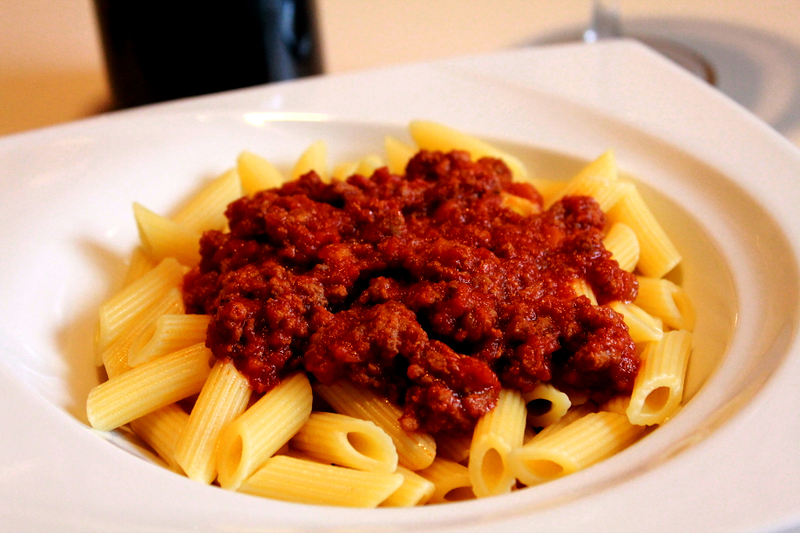 However, the Ragù can be cooked for two or three hours more, acquiring a quite extraordinary taste! You can store the sauce in the fridge in a sealed glass or plastic jar for up to 2-3 days. You can also freeze it to keep it more days. 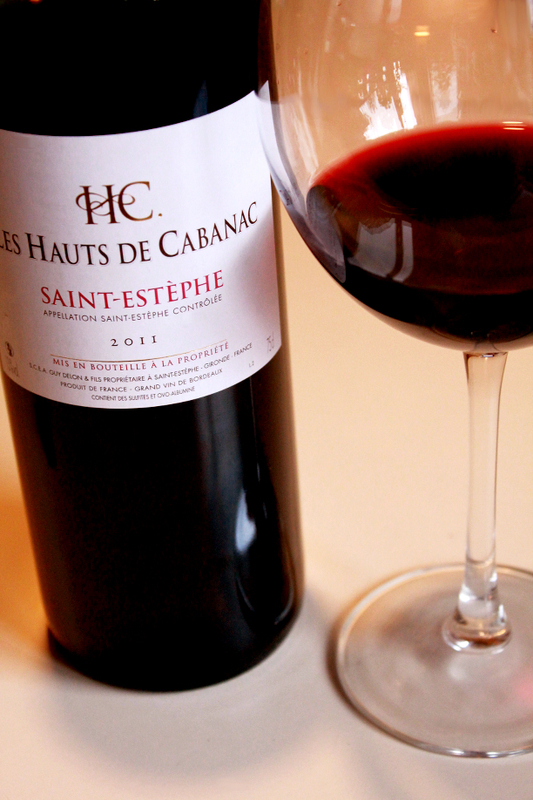 For the Ragù I chose “Les Haut de Cabanac” 2011, produced by Château Ségur de Cabanac. This Bordeaux blend, Cabernet Sauvignon and Merlot grapes, ruby color with garnet reflections, has a good body, good softness and excellent balance, thanks also to Merlot. The tannins are very delicate, but can be perceived uniformly given the aging of the wine in barriques. On the nose, aromas of coffee, white pepper, ripe red fruit (cherries and blackberries) and undergrowth. On the palate, spices and coffee. If you cannot find it, I recommend wines with good evolution, based on Cabernet Sauvignon and Merlot grapes; alternatively Sangiovese-based wines, such as Chianti Classico or Vino Nobile di Montepulciano!